I've been dating the man I love since high school so it's been 6 years for us. It was more than just a relationship however he was my diary, my best friend and we did everything together. His family seems to have complete control over his life. Here we are all grown up with a child and they still have a big role to play in what goes on between us. We recently broke up because of them and now they are convincing him to leave us behind and pursue his career in another state which means the next time he sees us our child will be 3 and won't know who he is. I feel like I have no win against them. He knows how they are he's just afraid to speak his mind. It's kind of like tug of war he doesn't want to have to choose between us and them but I don't want him too. I've recently had a reading done and I know that he loves me but I don't know why he is destined to be like his father. His mother left his dad to raise him when he was an arm baby but he didn't really raise him either, his grandmother did. The most he learned from his dad is how to use condoms and keep multiple women. I broke him out of all the things his dad influenced on him even got him to move in but he got a call from them everyday saying he needs to move back home etc. I love him with all my heart and I want our family more than anything but right now I feel like there nothing I can do to change the way they made him feel about me. They always did had something against me seemingly they told him to get a blood test for our child because they didn't know me but the grandmother only went by what his dad said but he lied because we conceived our child under his roof he knew me very well. His dad has convinced him not to love and be with just me but turned around and got married. He's leaving really soon to go and I just don't know what to do anymore. It sounds like you have a lot on your plate. I would start with a honey jar for you & him. Also another jar for you & his family. Secondly, I would follow the Honey jars with a "Stay with me spell kit" . I recommend you work some self-care into your conjure work, like Blessing and Crucible of Courage. Being a young mother with unsupportive and gossipy relatives is tough. Perhaps you could add some Stop Gossip work on the relatives to keep peace with the family. You could make a little dolly or get a figural candle for each one of them and baptize it to their name with whiskey in the name of Jesus Christ and put Stop Gossip oil on it reciting Psalms 14, 31, 36, or 37. Thank you both, I'm really looking forward to trying these things out. When i love, i love hard so it's becoming difficult for me to just stand by and let this happen. I never could walk away without a fight but i felt like i've fought long and hard enough. So atleast i know If they don't work then maybe it's just not meant to be. I'm looking for suggestions on how to draw my ideal mate. The past couple months I've done a lot of reflecting on myself and my previous relationships, especially in how much I've given of myself to my partners without getting much back. Some members may not believe in these concepts but I'm an empath, a Scorpio, and have this very strong instinct to help people. I don't give up on people and so obviously I've had a lot of people use me up, take me for granted and been hurt. I've also put aside a lot of my wants and needs for what I thought was the betterment of my partner and the relationship. By the way, I've done a lot of work on myself. I've let go of a lot of that past pain, resentment, anger and heartbreak. Ultimately all I want is a man I'm compatible with to eventually marry and start a family. I want a normal, mundane life with my love and family, complete with little tiffs over who's turn it is to take out the garbage or who has to pick up the kids from school. I'm not one of those women who is obsessed with the idea of being married. Finding the right man for me is the focus, not finding just ANY man to marry and have kids with. So far I've written a list of qualities I want in my ideal mate and it's almost 5 pages long. I know that might sound really over the top but I've been reading a lot of posts in this forum and one suggestion that is consistently given is to be as specific as possible. Be assured though that the majority of what I've written focuses on his character and how I want him to treat me and love me. I'm not at all focused on looks, him being super duper rich, his status etc. I honestly don't care about that crap. I just wouldn't want to meet a man who has all the qualities I've listed but then find out he's a closet racist or misogynist or some other kind of deal breaker for me. Everything in my list is the way I treat the person I love and the things I would do for them. Like I said, I want a male version of me. Though at the same time, I am a little concerned that I'm being too specific and that I'm ultimately describing the "perfect man." I swear, I'm not looking for perfection. I'm not perfect, I know no man will be. I know we'll have our own kinds of problems, obstacles and life will throw us curve balls. I'm very realistic on that front. But I figure if I exist then there has to be someone else out there like me, probably looking for me just like I'm looking for him. I'm not sure how to express that in my petition or to whatever angels, saints, spirits etc that I might ask for assistance. I guess I'm hoping they'll see that part in my heart. Am I being naive? Is there a way to express that in the spell? - A supportive, loving, determined man with a truly good heart, strong character with morals who values honesty, loyalty and family with similar hobbies/interests as me. - Someone who appreciates that I'm different from most people and accepts me for who I am and loves me unconditionally. - A man who is healthy mentally, emotionally, and physically, no STIs, no addictions. - A man who isn't afraid of commitment, wants a deep true love and a life-long committed monogamous relationship with me and for us to start a family together once it's the right time for us. - A man who is stable financially. He doesn't have to make millions but I'd like for him to have steady work (obviously I'd prefer for it to be something he genuinely enjoys or gets personal satisfaction from), his own car and his own place to live. Basically that he has his life together and wants to share his time, money and life with me. - Someone who I'm compatible with sexually. I want a sexually fulfilling relationship. - A man who is open spiritually and doesn't look down on me for practicing my beliefs. - Preferrably a man who is within 5 years of my current age when we meet. I've read Cleo May can help with attracting a nice, financially stable man. I've also read Jezebel Root can help with that. Is there anything else I should order to help achieve the best results? Any herbs that can help with any particular aspects of what I want? Any saints, spirits, angels etc that I can call on for help? Are there any spells maybe members here have done for this purpose that can share what worked for them? I've been looking for similar spells online so I can customize it for me but aside from the general love spells and ones that focus on a specific target, I haven't had much luck. Especially when it comes to spells with a petition of the qualities I want in a mate. The biggest problem I'm having with this spell is the HOW to do it. Usually after researching I have an instinctual pull on how to go about the work I want to do. This time I think I'm getting a little overwhelmed with information. I know this was a long read but I wanted to give you all the details. Thanks in advance. It's safe to say the spell is what you make it. (Old lover or new lover) It's the intentions you are putting into the spell. Make it a beautiful experience for yourself. Since you are researching so much it's understandable why you are overwhelmed. I don't think you are naive I don't know what your situation is, but honestly your list does seem very to the point. Not that it's a bad thing but it's definitely a lot, and quite frankly looks like THY perfect mate. I hope you get what you are looking for but why not just look for 5/7 things that ultimately matter the most? I mean really matters. What if you could only have 5/7 qualities in a man ? What would those be? Ex: loves me for all of me, committed in all aspects , stable, lives a healthy lifestyle, mature, and sexually satisfying. As for what you can do depends. I would first work to find someone before burning and bride and groom for marriage. Come to me, love me,attraction oil and fire of love can be good to attract men. Idk what kind of herbs are in the love herb mix but I would add rose pedals, catnip, damiana, violet leaves, and queen Elizabeth root. 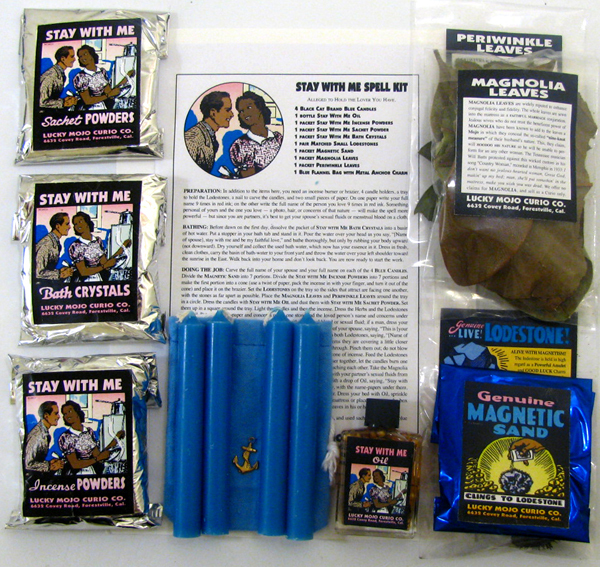 Once you find a man of your liking maybe use the stay with me and bride and groom candle at that point but I would focus on just finding a man you have a good connection with after which you will realize whether or not he is a good fit for you. Oh yes, I wasn't planning on using the bride and groom candles anytime soon, I just thought I'd include that I have them in here in case anyone suggested something like that. I am trying to pair my list down and basically what you said is what it all boils down to. I'm just naturally a lengthy writer which is part of the problem, as you probably noticed from my post haha. I know I can use those oils but I'm having a really hard time figuring out what my spell should actually look like, the way to build it. The Love Herb Mix contains Rose Petals, Red Clover, Catnip, Lavender, Damiana, Cubeb Berries, Juniper Berries, Gentian Root, and Deer's Tongue according to the Lucky Mojo catalog. I also ordered Balm of Gilead which the site does say it eases a broken heart, soothes pain from arguments and spats, jealous people but I could have sworn I read somewhere else that it eases the broken heart but also draws new love to you. I can't find that now though. This spell that I want to create is solely for finding a man I can share a true, committed, very long-term love with a deep mental connection that has certain qualities so my needs are met. I'm very determined to follow the normal stages of growth for the relationship without rushing to marriage and kids. Like I said, finding the right guy is the goal. He's not someone I'm using to fill the "position" of husband and father to my children. If anyone has suggestions on how I can build this spell I would love to hear them. I have most of the items needed for the work I think, it's just a matter of putting them to use in the correct way for my goal. Yes, that was VERY lengthy post. Please be conscientious of what you are writing (as hijacking a thread is not allowed) as the moderators have many posts to answer. This ought to be sequential, in my opinion. I would perform an attraction spell with the love herbs and ask for the perfect mate for you. Asking for the perfect mate then saves you time on all the specifics of what you want. And this may have to be performed anywhere from one to a couple of times. If there's a problem with the first spell, you may need a blockbuster or a road opener. Then, repeating the spell. And Loabeliever is absolutely correct in her opinions. I'm sorry I didn't know that long posts were a problem. I was trying to give all the information to save time. A lot of the time, I see people reply with "do this or that" and then the person has to explain several times that they've already tried it or they've done the self work that was prescribed etc. Then no one answers about what else can be done now that X and Y methods have already been exhausted. People just think that person's question has been answered when in fact it hasn't. Also, I poured over this post looking for anything that would work for my situation BEFORE I posted. Just a couple posts above mine is someone recommending self-work. My post was long but I was trying to address everything in one post so I wouldn't get the same answers that were previously posted and not applicable to me. I wanted people to understand where I was coming from and that I was serious about the time, effort, energy and actual work that was going to go into such a large working. This forum has a lot of information. I am sure you will find what you are looking for, just don't overthink and don't over complicate. Your posts are long and maybe you should get a reading or professional worker to help you determine how you should start so your not worried and a reader can give you insight directly based on your situation. -make it simple but meaningful. A simple love bath, a candle dressed in herbs, a mojo bag. I mean it's endless... just start when you won't second guess what you are doing. Pick what you like and do that it's all in you. Some great advice from loabeliever! Thank you all for the useful tips through other people questions. I hope that I am on the right thread for this question. I see that I need an attraction spell to draw my true love but i feel i might need something to fix me first. About a year and a half ago I went through a break up and spent the past period of time recovering. I am now in a happy mentally healthy state and am looking to draw a true companion. So far I have had read through some really great things about manifesting this, however, I am wanting to work on myself before manifesting someone I am not ready for. I would like to know if there is anything I can work on my self for the actual desire to date and readiness for true love? I know how silly that must sound, so I hope I portrayed this accurately. I get out with my girl friends, I work, and I am social but I am completely lacking the desire to actually date. During my last spell I happened to add in that I didnt want the desire to date, and well now I want that desire so I can adequately preform my true love spell and be open to receiving my gift. If this is just something I need to work out myself(non magical) then than you very much for your time. one last thing, I know that this is part of my spell because I can constantly feel it working. It has worked like a true charm, I have had several magical blunders (all self induced) but i dont want that last spell to quit working, i just want that revised/fixed if you will. So if there is a good way to going about getting ready for true love I am all ears. I think a good place for you to start would be to try and figure out *why* you were/are turned off by dating. I performed that Clear and cut spell, at the end of the spell I asked God to take the desire to date till I was stable in my life and material world (cause I have a huge problem with getting wrapped up in love and letting my business fall to the ground) or to feel desperate running after guys to date. About 6 months ago I came to a pentacle point of not only me being disgusted with dating but I would look down on my friends in disgust for them being "boy crazy". I even got to a point where i could find just about ANY reason to not go on a date or accept a date. So in the non magical world i realized this was an issue and I went to work this out. I no longer feel these strong urges of disgust with dating but i still lack the desire to give ANYONE a shot. I personally dont have self esteem issues, no exs worry me, Im stable in my life and i do very much desire a mate/soul mate/true love. I just know I am not gonna find him even if I do the love spell if I dont do something about the blockage of even getting out into the dating world. I read "Doing Magic" by Genevieve Davis and she explains my primary issue of not being in the "receiving" state of magic. So far everything i have desired to manifest I really have been able to. i just know that if I ask for my soul mate now I'll wind up missing him because i know for certain i am not ready to receive him. I do apologize if this is too much in a question forum to answer I was just giving it a shot. I have an reader with AIRR, Valentina Burton, That is amazing to work with if that is best? ps i do love what you suggested, as I believe it will help not only in this but other parts of my life as well. This is getting complicated for the forum so, I highly suggest what you already suggested: talk to Valentina Burton. She will help you! Good evening! So glad to find this thread. I wanted to do some work this weekend. I'm going to do some healing and I have a meeting scheduled with Ms. Yronwode but it's a little far out. What would you do with a twin flame who you want to keep around? The two of us fit together but we scrap and get into arguments even when we are on the same side and we're saying the same thing. It's weird. But the good times are sooooo good. Anyone ever dealt with this? It is very rare to meet your twin flame in life. And, yes, it will cause A LOT of spiritual confusion when one is around their twin flame. Things like: saying the same things (as you had just discussed); thinking the same thing; having the same events happen almost at the exact same time (example: getting an identical health problem); too much shared energy that causes tension, etc. Be careful. If this is a true twin flame, they will know that you have placed spells on them! Thank you so much. I hope you've been doing well. There's someone I've loved deeply for the past 3 years. We were strangers at first, I honestly didn't think I had a chance with someone like him. But we somehow became friends as classmates (specifically job corps). Most of our interaction was in class, things went from casual to a sort of secret love for each other, despite that I was held back by another relationship (which was ultimately toxic & ended, but well). Fast forward through working together, intimate talks, & funny memories to me asking him out in the summer after graduation. Despite my behavior at times (friending & unfriending, gushing over photos then deleting-all over anxiety from having to hide my feelings for him) he said yes to the date. But it went terribly, I could barely talk or move, prompting him to do the same, & ultimately ran home without a proper goodbye. Letting my nerves get to me left me completely torn; I wanted to reconcile, but he ultimately shut me out. It's been 2.5 years since, with less than a handful of contact. But this year he's talked to me a bit, even if months/weeks inbetween; also finally accepting a friend request online. He even moved back to the area in April, after seeking a new life & lover in Oregon failed. While I feel he wants to be close again, & he's said he understands how I felt (as I sent several letters of apology/explanation/worry for him), I know his extremely small steps can only mean he's still very wary. Everything is just an unbearable "so close yet so far" situation. So I'm hoping a "bring a lover back" spell may help with things, as I truly want to reconcile & ultimately finally be together by his birthday in November (at least by the end of this year). I'll be using a spell from Yronwode's own book, concerning soaking damiana in whiskey to sprinkle on the doorstep for 3 weeks (my subject, himself, even loves jack daniels). But I'm wondering if adding a name paper will make things stronger (as I obviously don't want a random new lover, but my old/new friend)? Also, if spitting into the bottle will do any good as well (as where I stay now is not my own property, so maybe my own fluids will help get him back to me no matter my location)? Thank you so much Miss Aida! Now I can try this with greater confidence. Also, is there any specific amount of time the Damiana should soak? Or is it just an "all systems go" sort of thing? Also! Should the bottle be completely empty by the 21st day? And if its not do I keep the rest to sort of keep the spell active until he's in my life again? Will getting rid of the bottle after his return break the effect of the spell? I think you are overthinking a simple spell. You can soak the damiana for as long as you like, but I'd say soak it at least overnight. The bottle doesn't have to be empty after the 21 days, and you can keep doing it if you haven't gotten the results you want. Getting rid of the bottle won't break the effects of the spell. Oh I see. I actually did end up soaking it overnight! It's good then that I can also keep reusing it.